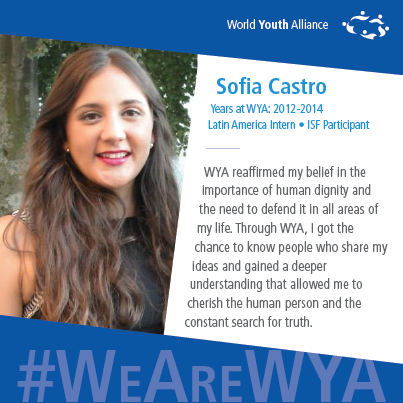 This is the story behind how WYA’s ideas animate a whole generation of young people to begin to strive for a better world that fosters authentic integral human development. It touches one person at a time until we end up with over 1 million young people all dedicated to giving it effect in public life at all levels. 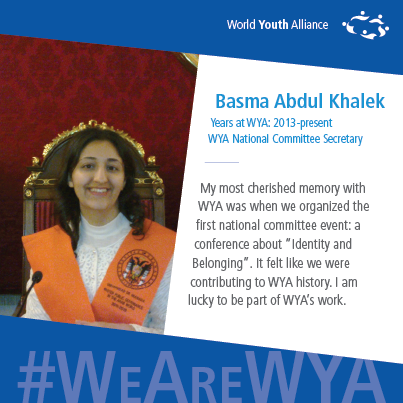 And all this started when they signed the WYA Charter and officially became members of the World Youth Alliance. As you read their personal journeys, we hope you become inspired to join us! and I agree to the WYA Charter. 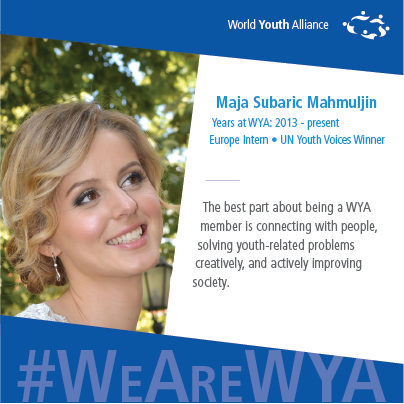 I became an active member of the World Youth Alliance in 2006, when I was only sixteen years old. I would say that signing the WYA Charter was the best decision I have ever made in my life. It happened to be the beginning of an amazing journey throughout my youth that is still ongoing. 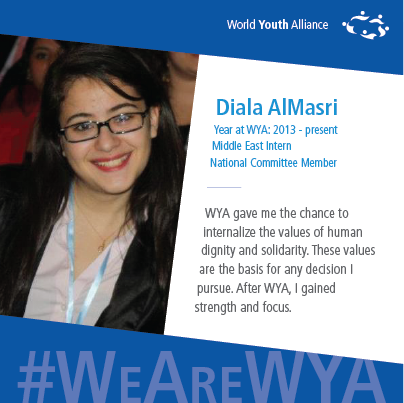 Through WYA, I found young people from all over the world who were passionate about the defense and promotion of human dignity. 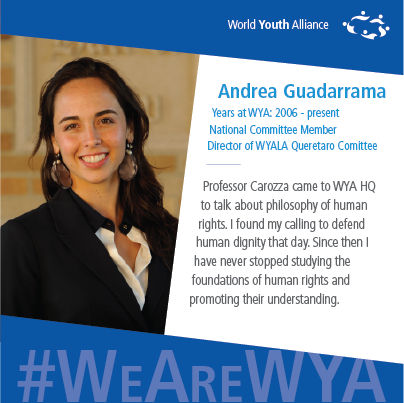 Despite my young age, WYA was committed to getting me involved in interesting academic studies in areas such as philosophy, art, history, human rights, and international law. I cofounded a WYA chapter in my city with some friends. This experience informed me as a social leader. We organized a congress on human dignity for 5,000 youth while we were still in high school. 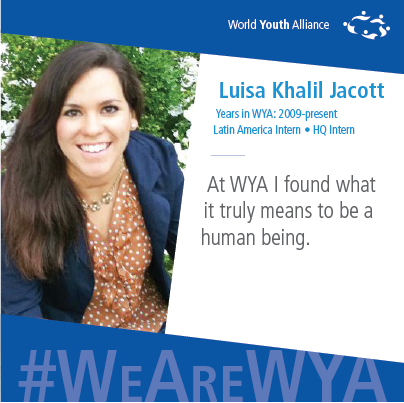 My experiences with WYA at the United Nations and leading the chapter in Queretaro led me to law school. During my time in law school, I was always concerned about the protection and defense of human rights in my region. The education that WYA provided allowed me to start study groups in my university where we discussed human dignity and human rights. I got a good job in the state of Queretaro’s Human Rights Commission, where I promoted human dignity through public programs. Today, I consider myself to be an international young woman whose foundations could not be stronger. WYA made me a proposal on a lifestyle that I am glad I took. I have travelled, I have friends from places and cultures I never imagined I would, and I became a positive leader in my community – but its greatest impact in my life has been that WYA taught me how to dream of being better and building a better world. WYA gave me one of the best summers I ever had. 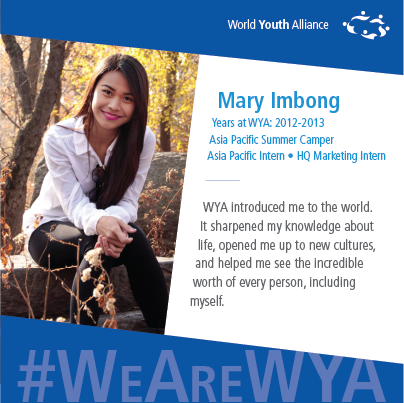 My first entry into the WYA world was when I joined the WYA Asia Pacific internship. I distinctly remember the feeling of wanting to fly to WYA every morning. I loved the work that I did. Besides the enlightening Track A training lectures, I was thrilled by the many opportunities to share my skills with co-interns and with other members. We had a lot of projects that allowed us to practice management, creativity, and hospitality whenever we opened our events to the public. Through the projects we reached out to a lot of new people with WYA’s mission, and were able to share our skills and culture. One of my favorite events was the First Emerging Leaders Conference we held in Asia Pacific. As part of the planning team, I learned a lot of new things, and improved a lot of my artistic potential through the design and video work I did for the conference. I grew skill-wise and attitude-wise, and it all just felt so fulfilling. Ending the WYA internship was bittersweet. I still miss the office and wonderful people I shared it with. The experience is life-changing, and is something I would do over and over again. As a journalist I have the privilege of meeting inspirational people, including Anna Halpine, who was my first contact with WYA. I interviewed her for my newspaper in March 2013, when she was in Zagreb for the opening day of the WYA Croatia Committee. After hearing Anna speak about human dignity, I knew I wanted to be a part of WYA. Meeting young, enthusiastic Croatian members who finished Track A Training only affirmed my decision. I was on my way to becoming an active member of this global organization with a noble mission: to promote the dignity of every person and build solidarity among youth from developed and developing nations. After completing Track A Training I got involved in many activities of WYA’s Zagreb chapter as part of the media team. In just a couple of months WYA Croatia (chapters in Zagreb, Split and Osijek) achieved a lot – we had more than 20 accredited Track A members and 500 supporting members who had signed WYA’s charter. We also worked to organize WYA Week in Zagreb, Split and Osijek in March 2014 with Croatian and foreign experts in philosophy, politics, economy, law, media and culture. For me the best part about being a WYA member is connecting with people, solving youth-related problems creatively, and actively improving society. I use my professional skills as a journalist to promote a culture of life, the importance of family, and values such as human dignity and solidarity. My country, Egypt, has been going through many upheavals and I believe that an organization like WYA that promotes the fundamental, crucial concepts of dignity is what my country really needs to recover. 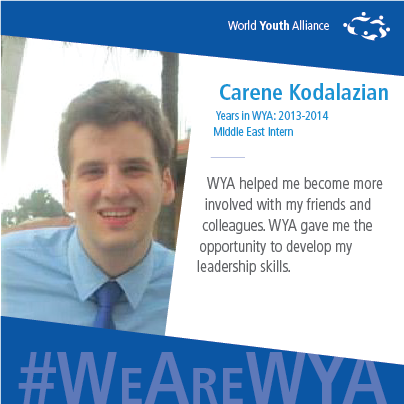 I was first introduced to WYA when I joined the 2013 International Summer Camp. It was an extraordinary experience that taught me about dignity and how this basic concept stands at the center of everything we do. I was introduced to campers from diverse cultures and we communicated what dignity means and experienced solidarity in the activities and workshops that we had. I have experienced this deep solidarity also in my contact with WYA’s regional offices around the world. When I returned from camp I immediately started Track A Training. 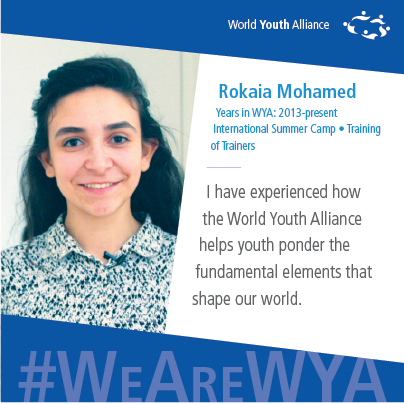 Camp had made a huge impact on me and I felt the urge to get more involved with WYA’s mission. 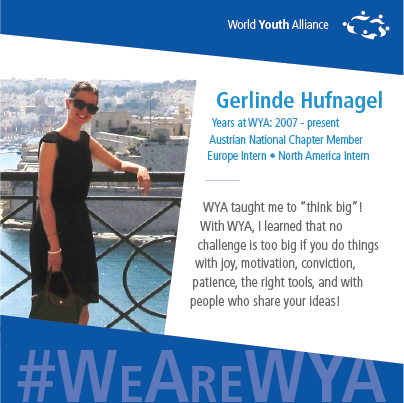 The amount of support I received from WYA’s North America and Middle East offices motivated me to become a certified member. 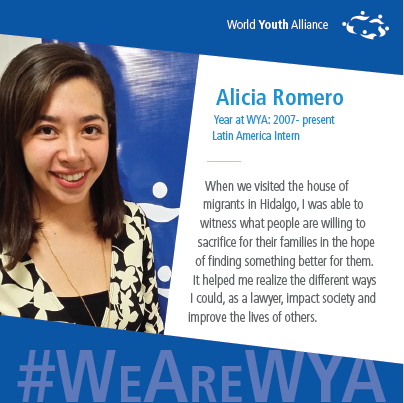 I am now undergoing training to start workshops in my country and introduce WYA and its mission, so it can impact others as profoundly as it has impacted me. Concepts based in dignity and oriented towards improving sustainability and development are interwoven in simple ways for every camper to understand. WYA understands the dynamic role that all cultres play in our globalization. These concepts and ideas might sound advanced for a 17-year-old, but since signing the charter, I have experienced how the World Youth Alliance helps youth ponder the fundamental elements that shape our world. Click on the images below to hear even more great stories from our members. 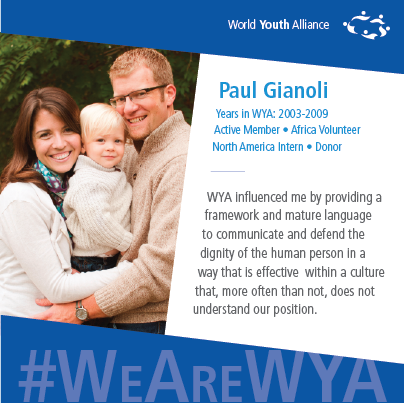 Want to share your WYA story with us? We would love to hear from you. Email us at marketing@wya.net.